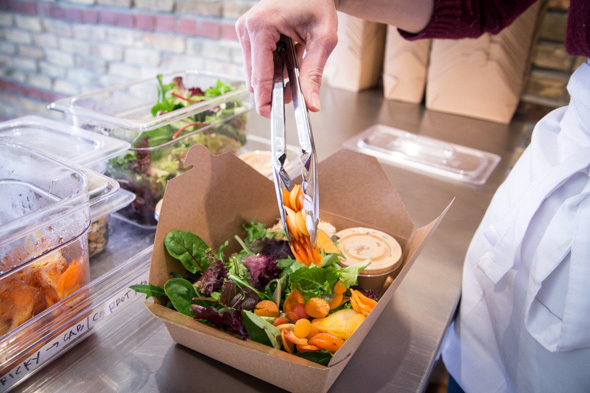 The Goods offers fast, fresh clean-eating including a menu of salads, bowls, smoothies and soups that can be ordered in advance online and then delivered in personalized brown bags. In store, the selection changes with the daily meal plans, but for the most part can be expected to follow vegan and raw food principles (honey found in some recipes is an exception). The concept doesn't aim to convert vegans but rather supplement normal diets with a regular influx of superfoods. 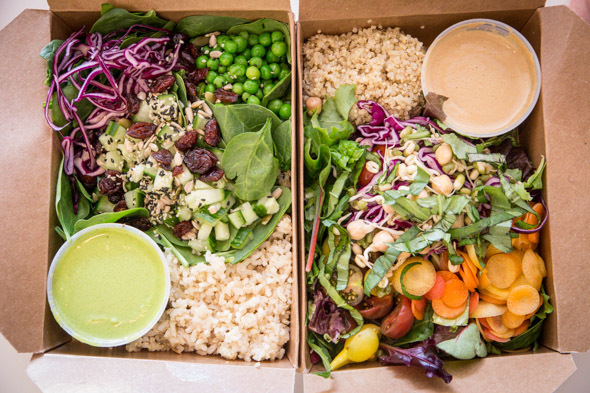 Vibrant salads like the Tricky Tahini ($12) are packed into boxes with quinoa, mixed greens, house-sprouted chickpea and mung bean sprouts, carrots, cabbage, grape tomatoes and generous portion of house-made sesame dressing. Other options like the Green Gold ($12) come with creamy avocado-based dressing and toppings like peas, cranberries, wild rice and mix of crunchy seeds. 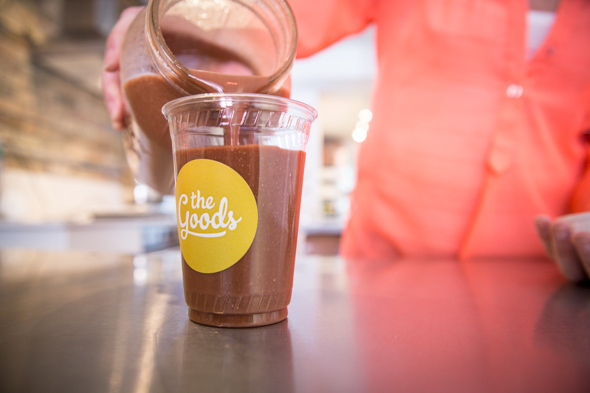 Organic green smoothies ($5/300ml, $10/L) are as Labute says, "like mainlining mother nature." Each drink contains two to six servings of fresh raw vegetables, fruits and leafy greens plus seeds like chia, flax and hemp. Surprisingly it's super tasty and makes me feel totally pumped for the rest of the day. I try the Insteada ($5/300ml, $10/L) too. It's a blend of raw cacao, maca, chia and cinnamon with a kick of cayenne. As the name suggests, it aims to be an alternative to most caffeinated pick-me-ups, only it won't cause a 3 o'clock crash. 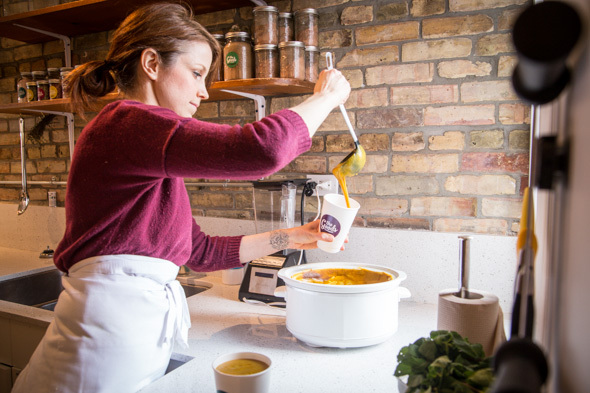 Curried yam soup ($6.50/cup, $13.00/jar) sold in to-go cups is deliciously rich, spicy and creamy. The flavour is so much more than the sum of its parts, which as it turns out, is a handful of ingredients: onions, garlic, miso broth, coconut milk, spices and whole yams - skins and all - which gives the soup this notable earthy quality that I can compare only the tannins in wine.